Lot 573. C. Junius C.f. 149 B.C. AR denarius (18 mm, 3.91 g, 2 h). Rome. 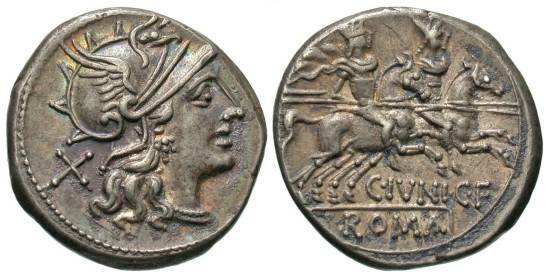 Helmeted head of Roma right; behind, X (denomination mark) / C · IVNI · C · F below, ROMA in exergue, the Dioscuri riding right, holding couched lances. Crawford 210/1; Sydenham 392; Junia 1. Toned. Good very fine.